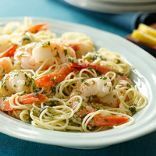 I serve this with 1/2 cup of rice or pasta with basil pesto . Cheating, using bottled peanut sauce. Still yummy, though! 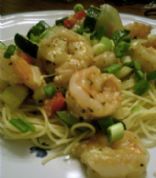 Angel Hair Pasta with Shrimp!! Spicy and tangy. My family went crazy over this! We use fresh parmesan cheese as a topping.